Don Rojas, (born 1949) Saint Vincent and the Grenadines isthe former Communications Director, NAACP, editor at the Amsterdam News and former press secretary to Maurice Bishop of Grenada's New Jewel Movement. Don Rojas (born 1949) is a journalist and political commentator from . He was the Editor in Chief of Grenada’s national newspaper The Free West Indian. He served as Prime Minister Maurice Bishop's press secretary from 1981-1983, until Bishop was murdered in a coup d'etat. When U.S. Marines invaded Grenada in 1983, he was deported by the U.S. military to Barbados. He is married to Karen Codrington. Don Rojas studied Journalism and Communications, University of Wisconsin at Madison. One of his first positions was assistant director of communications for the National Urban League. Following his stint there Rojas became an assistant editor at a Baltimore, Maryland based African-American newspaper. Baltimore would eventually become his permanent home. In the late 1970s Rojas moved to Grenada where he served as editor-in-chief of the national newspaper The Free West Indian. At that time the People's Revolutionary Government of Grenada--led by charismatic Marxist-Leninist Prime Minister Maurice Bishop was in power. Rojas became Bishop's press secretary and played a leading role in Grenadian politics during the early 1980s political uprisings which led to the murder of Bishop and a U.S. invasion of the island. 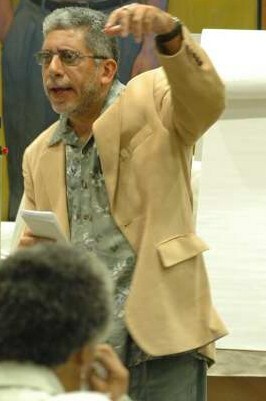 Prior to this political instability, Rojas successfully organized the first conference of Caribbean journalists and the first conference of Caribbean intellectuals, both held in Grenada. Rojas was expelled from Grenada by U.S. forces after the 1983 invasion. Rojas has edited several books about Grenadian revolution and the events leading to Bishop's death. Don Rojas next moved to Prague, Czechoslovakia to serve as an executive for the International Organization of Journalists. His job involved assisting member journalists and media workers in North America and the Caribbean. In 1985 Rojas organized the first tour of Eastern Germany, Czechoslovakia, and the Soviet Union exclusively for African-American journalists. One of the 16 journalists on the tour was Alice Palmer-later employer and political sponsor of Barack Obama. Rojas became the only black journalist to cover the 1985 summit meeting between U.S. president Ronald Reagan and Soviet leader Mikhail Gorbachev. On June 2, 1988 Don Rojas was refused entry to Grenada from Cuba. He was to have attended the Maurice Bishop Patriotic Movement Convention, but was flown out the next day. Time for a Left Third Party? Don Rojas returned to the U.S. in the early 1990s executive editor and assistant to the publisher for the New York Amsterdam News. At the time, the Amsterdam News was the largest black owned newspaper aimed at a black audience in the country. This position would give Rojas powerful leverage in the black communities and among those businesses and politicians who wanted access to this audience. Unfortunately, as he would later find out, because some groups considered the Amsterdam News alternatively anti-Semitic and dangerously liberal, this position, along with his role in Grenada, would come to be used against him. In 1993 the newly appointed head of the National Association for the Advancement of Colored People (NAACP), Dr. Ben Chavis, hired Rojas to serve as his communications director. Because there were many within and without the NAACP that wanted to see Chavis ousted, Rojas's appointment almost immediately began to be used against Chavis. Rojas was called out as being a "dangerous leftie," according to www.zmag.org. His role in the revolutionary government of Grenada was also used to show his unfitness for the NAACP. The Jewish community, long supporters of the NAACP, were concerned about his past at the New York Amsterdam News, because of the perceived anti-Semitic leanings of the paper. Chavis's position was doomed almost from the start and his term was ended after only 16 months. Rojas then settled soundly in Baltimore where he began a career in the private sector. In 1996 Rojas founded the first black-oriented Internet portal, The Black World Today-which today is just one part of Rojas's multimedia company called Communications for a New Tomorrow, "dedicated to the reporting and dissemination of relevant news, views and useful information about people of color communities around the world." In 1998 The Black World Today was nominated for a Webby Award, the cyber-world's version of an Academy Award. It was in the running against communication powerhouse sites CNN and Time. As of 2002, The Black World Today was still a leader in black-oriented websites. In March 1998 “Endorsers of the Call” to found a Black Radical Congress included Don Rojas, Publisher, Black World Today, New Jersey. On April 7 2004 in the Whitman Theatre at Brooklyn College. A multinational crowd of 2,000, mainly people from Haiti and the English-speaking Caribbean, packed the hall to hear a program entitled "An Evening with Friends of Haiti: The Truth Behind the Haiti Coup." A broad range of speakers and cultural performers ignited the stage for three-and-a-half hours to express heartfelt anti-imperialist solidarity with the besieged Caribbean country. Haiti has once again suffered a horrific atrocity with the U.S.-orchestrated kidnapping of its democratically elected president, Jean-Bertrand Aristide, on Feb. 29. The rally was co-chaired by Kim Ives and Karine Jean-Pierre from Haiti Support Network (HSN), with Pat Chin and Sara Flounders from the Workers World Party controlled International Action Center. Other speakers included Alina Sixto, Family Lavalas New York/Tri-State Area; Rep. Major Owens of Brooklyn; Mario Dupuy, Aristide's state secretary of communication; Don Rojas, Amy Goodman and Bernard White, WBAI-Pacifica Radio; Ray LaForest, Haitian labor organizer, District Council 1707; Brian Concannon, human-rights attorney; Brooklyn College student Starr Bernard; Serge Lilavois, Support Committee for PPN; Los Angeles anti-police brutality activist Michael Zinzun; Dominican activist Marc Torres; and Haitian performers Marguerite Laurent and Phantoms. In 2009 Don Rojas served on the Advisory Committee of the Independent Progressive Politics Network. This page was last modified on 30 March 2019, at 16:18.